Balloons in Search of Needles - Thoughts From The Frontline - Investment Strategies, Analysis & Intelligence for Seasoned Investors. If there were rapids like this in the United States, it’s doubtful professional outfits could get enough liability insurance to make a business of running them. In Zimbabwe we just signed a piece of paper. Our guides swore nobody had ever been lost – well, except for a few people who disobeyed the rules and leaped in the water in the calm sections because it was 100° out. That’s where the crocs are. They promised we wouldn’t run into any in the rapids, which was good. More than a few of us got dumped in the water trying to run the rapids, but they had teams of kayakers who got you out quickly. The canyon below the falls is unbelievable, and below that is the even more impressive Bakota Gorge. And yes, you then had to walk to the top of the canyon up a switchback trail to get home. I would do it all over again in a heartbeat, but I would spend at least three months training for the hike out. That was most definitely not in the full-disclosure-of-risks one-page piece of paper. It would be hard to miss an analogy to the stock market. Everything’s peaceful and calm, you’re drinking some fabulous wine, eating some fantastic fresh game and fish, looking at all the beautiful animals as you drift easily with the current. Anybody can steer the boat in a bull market. Until the rapids hit and the bottom falls out. 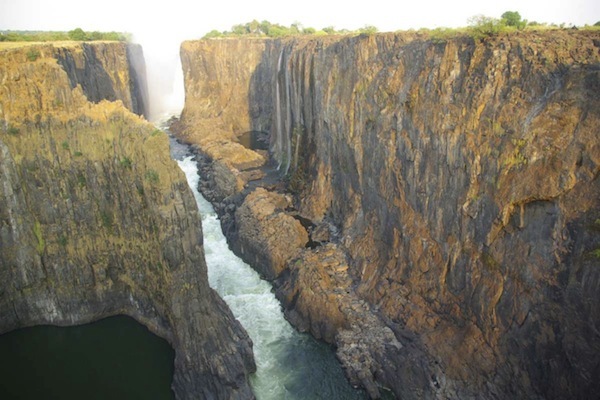 As an aside, while the large waterfalls are majestic and awe-inspiring, the smaller ones are more hypnotic. I love the sound of falling water. I could listen for hours. The one place I don’t like to see waterfalls is on stock charts. Those leave me awestruck at the market’s power. They do have the power to focus the mind, however, especially when we own the shares that just went over the falls. 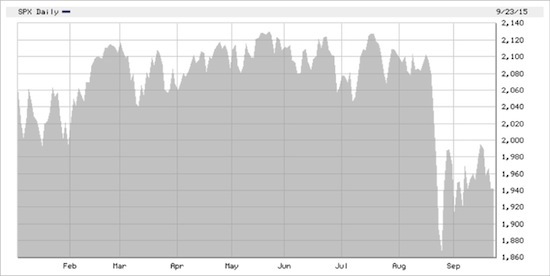 The US stock market is having the most turbulent year we’ve seen in a while. It’s not terrible by historical standards, but we have a full quarter to go. And next week it’ll be October, a month in which the stock market has run into trouble before. With all that in mind, this week I want to take a look at where stocks stand and maybe offer a thought or two about the events that could bring us to the next waterfall. Here is how the waterfall looks so far this year. Barely a 10% move peak to trough, and it lasted for just a few days. We see a lot of jostling, followed by the harrowing plunge in August, and then a partial (less than halfway) recovery. Where do we go from here? Let’s start with the macro view. Back in July I showed you some research that I did with Ed Easterling of Crestmont Research. This was before the China sell-off accelerated into the headlines, so it is very interesting to read again in hindsight. (See “It’s Not Over Till the Fat Lady Goes on a P/E Diet”). Our view is that we are still in a secular bear market, and have been since the 2000 Tech Wreck. You may find that view surprising, since the benchmarks have roughly tripled since the 2009 low. Our analysis looks at price/earnings ratios to identify when bull and bear markets begin or end. P/E multiples were close to 50 in year 2000. In order for that bear market to end, they needed to drop into the very low double-digit or single-digit range, which has been the signal for the end of every long-term secular bear cycle for over 100 years. That hasn’t happened during the intervening 15 years. Can a secular bear market last 15 years? Yes. Some have lasted even longer, like 1966-1981 and 1901-1920. So this one isn’t unprecedented. And please note that the long-term secular cycles can have cyclical movements inside them. Again, we see secular cycles in terms of valuation and the shorter cyclical cycles in terms of price. 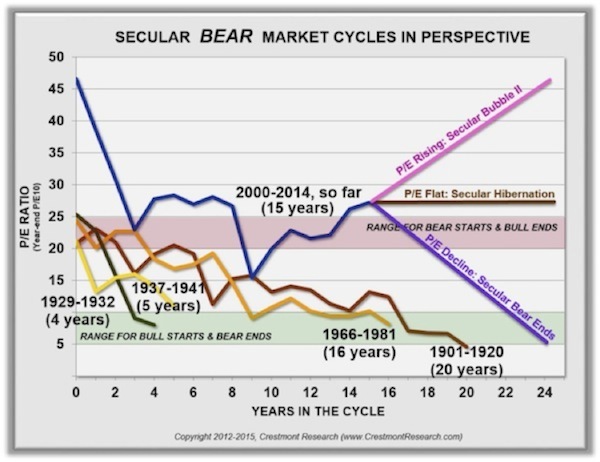 (Unless this time is different) long-term secular bear market cycles will always end in a period of low valuations. Currently, P/E ratios (or any other valuation metric you want to use) are not low enough to provide the boost that typically starts a new bull market. They were closer in 2009 than today, but have never dipped into the area that would mark the end of the bear market and the onset of the new bull. We’re still riding the same bear. What’s taking so long? Our best guess is that stocks were so richly valued at the 2000 peak that it is taking the better part of a generation to work off that excess. In order for this bear to end – and the new bull cycle to begin – valuations need to tumble. That can happen only if prices drop considerably or earnings rise without pulling prices higher. Obviously, there can be many trading opportunities within a secular bull or bear cycle, but Ed’s research says we have three long-term options from here. If P/E ratios decline toward 10 or below, we will be near the end of this secular bear. A new bull cycle should follow. If P/E ratios stay near where they are, we will be in what Ed calls “secular hibernation.” This would mean a lot of sideways price movement, with dividends having to deliver the lion’s share of stock market returns. If P/E/ ratios rise further, we will go back into the kind of “secular bubble” that created the Tech Wreck. I recall those years vividly, and I would rather not relive them. Now, combine this market situation with what appears to be a global economic slowdown. China is a big factor, but not the only one. The entire developed world is in slow-growth mode. At some point it will likely dip into recession territory. Canada is already there. I don’t think they will be alone for long. Japan and Europe are weak. I think the next true move to lower valuations will be a cyclical bear market combined with a recession. Can the stock market hold on to today’s valuations in a recession? Nothing is impossible, but I wouldn’t bet the farm on it, either. I can’t find an example of stock prices and valuations staying in place in the midst of a recession. Prices can fall slowly or they can fall fast, but I feel confident they will do one or the other. Our old friend Robert Shiller popped up last week in a Financial Times interview. Shiller is the father of CAPE, the cyclically adjusted price/earnings multiple, which looks back ten years to account for earnings cyclicality. He is also a Yale professor and a Nobel economics laureate. Shiller’s CAPE has been saying for several years that stocks are seriously overvalued. It looks to me a bit like a bubble again, with essentially a tripling of stock prices since 2009 in just six years and at the same time people losing confidence in the valuation of the market. When will the bubble burst? Shiller is less helpful there. He said the recent bout of volatility “shows that people are thinking something, worried thoughts. It suggests to me that many people are re-evaluating their exposure to the stock market. I’m not being very helpful about market timing, but I can easily see aftershocks coming. Now, if you aren’t very confident about timing, it’s arguably better not to use words like bubble and aftershock. You can be sure the media and analysts will jump all over them, just as I’m doing right now. In any case, Ed Easterling and Bob Shiller reach similar conclusions (though for different reasons). Neither sees a very bullish future, though both are unsure about timing. So when will we know the end is nigh? Sadly, we probably won’t, unless we begin to see signs that a recession is building in the United States. As the old proverb goes, no one rings a bell at the top. The same applies at the bottom. 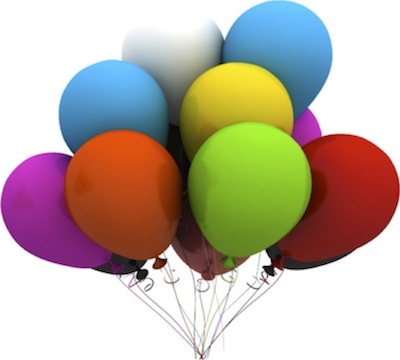 Let’s imagine the stock market as a whole bunch of balloons. One or two can pop loudly and everyone will jump and then laugh it off. You now have deflated debris hanging from your string. Eventually, enough balloons will pop that the weight of the debris overwhelms the remaining balloons’ ability to keep the string aloft. Then your whole bunch falls down. The last balloon to pop wasn’t any bigger or smaller than the others; it just happened to be last. In like manner, some kind of catalyst sets off every market collapse. It is usually something that would be survivable by itself. The plunge occurs because of all the previous balloons that bit the dust, but pundits and the media always like to point the finger at the most recent event. So, if Easterling and Shiller are right, balloons are popping and making investors nervous, but there’s not enough damage yet to drag down the whole bundle. What are some candidates for the last balloon? A Chinese “hard landing” is probably the biggest, most obvious balloon right now. And actually, China is big enough for multiple balloons. Their stock market downturn produced one pop already. Beijing’s currency adjustment may have been another one. On the other hand – seriously – a bubble created by millions of new, massively overleveraged rookie retail investors who then panicked and all tried to get out at once should not have much effect on US stocks. If that event was a truly signal of an imminent hard landing for China, I’d be concerned. But as I have written in the last month, the data from China shows their growth to be slowing but still likely to be above 4%. Not exactly disaster territory. We say in our new China on the Edge video (which premiered this week – click here to watch it) that the country is making a huge transition. Xi Jinping knows he must escape dependence on exports and build a consumer-driven domestic economy. This transition is having a global impact by virtue of China’s sheer size. On the other hand, the data I trust from China Beige Book and other sources indicates the economy is in better shape than most Westerners think. President Xi’s government has been up to the challenge so far. If China turns out to be the last balloon, it will have to be popped by something we don’t currently anticipate: a military coup, a vast peasant uprising, military clashes with the United States, a major corporate accounting scandal, etc. I am NOT predicting any of these; I mention them precisely because they are so unlikely. Does China have big challenges? Absolutely, but in general I think we know what they are, and the market is ready for them. I think the last balloon will pop elsewhere in the world. In the following sections I’ll run quickly through some other possibilities that come to mind. Again, I’m not predicting any of these will happen. My point is that they are real possibilities that could set off wider problems. The management of Volkswagen pricked its own balloon last week. In case you haven’t heard the news, the company appears to have engineered some 11 million diesel cars with software that lies to the owners and regulators on emissions tests. The stupidity of this is just overwhelming. This was not an accident, and it wasn’t one rogue programmer. Experts say many people within the company would have known about it. How far up the management chain it went, we don’t know yet. The now-former CEO, Martin Winterkorn, claims not to have known. I don’t see how in the world they thought they could get away with this scheme. The lawsuits, branding damage, and regulatory penalties are, at the very least, going to consume the company’s energy for several years. The chance exists that they could bring the company down. This is not a small company. It is the largest company in Germany, and Germany is the largest economy in Europe. Volkswagen has 600,000 employees and accounts for a big chunk of the country’s exports. Those exports are what make Germany the continent’s de facto leader. Not to mention that 40% of Volkswagen’s asset base is in its financing arm, which lends money to finance its automobiles; but the company borrows that money in the short-term markets. This short-term borrowing is what got GMAC and other financing companies in trouble during the last credit crisis. Attention must be paid. If the worst happens to Volkswagen, the impact on Germany, Europe, and the euro will be noticeable. I see media speculation that other German manufacturers could have taken similar shortcuts. If that’s the case, then all bets are off. OK, next balloon. I said a few weeks ago in “Riding the Energy Wave” that new technology was bringing down production costs in US shale oil and gas fields. Further, I hear stories from friends about auctions of drilling equipment where the prices are 20 cents on the dollar, thanks to cheaper rigs, the growing number of idle oilfield workers who will take lower pay, and declining drilling costs. There are winners and losers. Some of the overleveraged players are in deep trouble. So are their lenders and shareholders. Those with access to capital could do really well. Recall the sequence here. Crude oil was near $100 a barrel in mid-2014. Then it started to slide and moved into outright collapse when OPEC said in November that it would not cut production quotas. By this point many of the shale firms were running in the red. The lucky ones had hedged production at higher prices, but no one was happy. There was much talk about loan defaults and bankruptcy. Then it all faded away. Why? I saw the answer in an OilPrice.com article by Nick Cunningham. In the first half of this year, the US shale industry raised an estimated $44 billion in fresh debt and equity. Companies could roll over or refinance debt, taking on new loans in order to retire old ones. In a low-interest-rate environment, lenders were very willing to cooperate. More importantly, in the first and second quarters of 2015, many lenders expected oil prices to rebound. Yes, you read that right. After the 2014 collapse subjected many companies to a near-death experience, investors and lenders tossed another $44 billion in cash at them. Their faith in oil prices is touching. You gotta love old-time Texas religion. But the oil price rebound didn’t last,and now those same companies are on the ropes again. Cunningham refers to an Energy Information Administration study that found 44 top producers were spending an average 83% of operating cash flow on debt payments, double what they were paying three years ago. 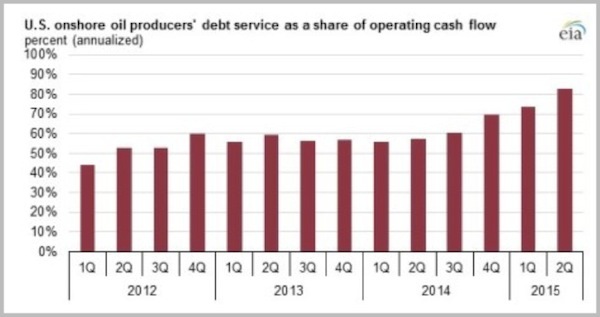 You can see in the chart above that debt service was below 60% of cash flow in 2Q 2014. If it was 83% in 2Q of this year, I can see it going over 90% for 3Q. That is simply insane. You cannot run a business with that kind of debt overhead. Either you borrow more – which is also insane (on both sides of the deal) – or you throw in the towel. I wrote last week that the flood of Middle East refugees into Europe is setting up a new clash between Germany and several countries to its east. That’s already happening. This week, EU ministers voted to allocate refugees throughout the continent – against national wishes in some cases. Hungary is particularly angry. I’ve seen estimates of a cost of over €1 trillion for settling the present flood of refugees, and that’s just for openers. My bet is that more and more refugees are going to be fleeing the Middle East (honestly, wouldn’t you?) and trying to find homes in Europe. God forbid that major instabilities crop up in Egypt or Turkey. Right now that’s unthinkable, but a lot of things have happened in the Middle East over the past 15 years that were unthinkable. This problem is going to apply even more strain to already stretched European country budgets. So far this year, we’ve seen Eurozone leaders (headed by Germany) force their will on Greece over its debt payments, and now they’re applying pressure with regard to refugees. This again highlights the degree to which countries are ceding their sovereignty to Brussels. Are there enough voters in these countries angry enough to make their countries leave the Eurozone or EU? Probably not, at least not yet, but the anger isn’t going away. And it may intensify as the refugee flow continues and grows. Now, combine this with the Volkswagen situation. If VW starts laying off workers, a domino effect will tumble through the economy. Merkel’s clever plan to bring in thousands of new workers suddenly won’t look so smart. Will she be able to reverse the flow of migrants? That would just send more of them into Eastern Europe, where they aren’t wanted. There’s more: the UK will likely hold a referendum sometime in 2016 on whether to stay in the European Union. Anti-immigration and populist movements are gaining strength in Spain and France. The continent’s linchpins are under stress. These trends could take Europe in many directions, but few will be positive for European stocks. I just gave you a few possible scenarios, any one of which could be the last balloon whose popping sets off a serious market downturn. It’s possible more than one could pop. But it’s just as likely that we Muddle Through over the next year. While the data suggests that US GDP is likely to be softer in the near term, there are no real warning signs. Still, it makes me a little nervous to have GDP growth sitting close to stall speed when a global event could push us into outright recession quicker than we currently imagine. Again, let me emphasize that I’m not predicting anything especially dire here. The most likely scenario is that markets will continue to muddle along without such drama. Nevertheless, I think we need to think ahead. Examine your portfolio now and think about how the scenarios above might affect you. Have a plan in place for what you will sell first. Put on hedges, or at least plan how to hedge if events suggest you need to. The best traders I know are smart people who think ten steps ahead, with a plan for everything. They tend to be good chess players. To some degree, this is what we all have to do. “I’ll decide when I get there” is not a winning strategy in most cases. Far better to decide long before you get there. Tuesday I leave to go see my friends Jerry Wagner and Peter Mauthe for a day in Detroit before heading out early the next morning to Toronto, where I will be doing speeches the next two evenings, getting up at a ridiculous hour on Friday morning to be back in Dallas for a lunch presentation to the National Center for Policy Analysis (NCPA). The editor of Transformational Technology Alert, my close friend Patrick Cox, will be coming in Sunday, October 11, for a dinner and to meet a few of his readers before we head out the next day to San Francisco, where we will hopefully meet with Dr. Mike West of Biotime and then spend the next day at the Buck Institute, the premier antiaging research center in the world. I hop a later flight to Portland, where I will be doing a speech for Aequitas Capital. Then the plan is now that we’ll somehow wind up in New York. Time is speeding by. There is so much to do. The book on transformation and how the world will look in 20 years is starting to take shape, but it is a much bigger project than I originally envisioned. 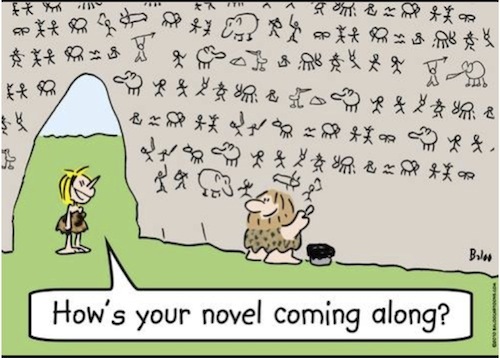 A friend sent me the cartoon below; and while I may be using more modern technology, the process is just as time-consuming. Sunday night, though, I will stop to take advantage of a rare event. Some of my kids are planning to join to watch the eclipse of the super harvest moon at a reasonable time in the early evening. You have a great week!